Another holiday themed commission from Christmas Past. 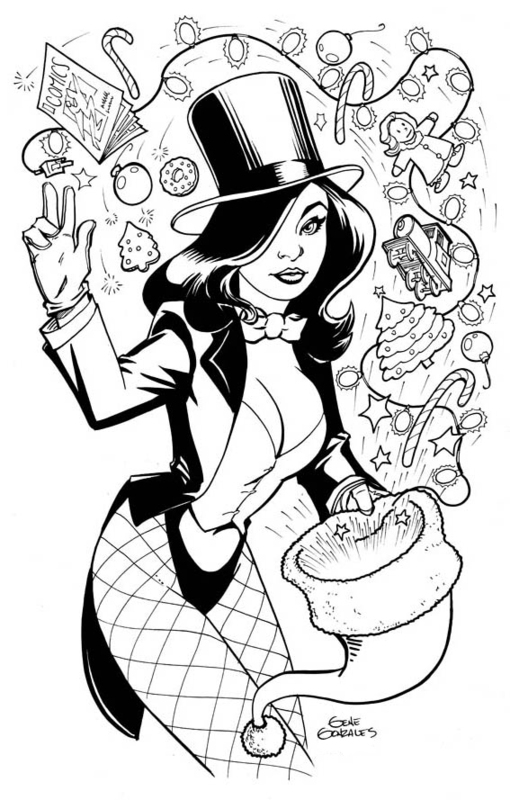 Zatanna the magician creating gifts in her own special way! This was done in ink on bristol board. This was done as an inked commission and a few years later I added some color to it for fun. I stayed with the flat color style of the silver age of comics which fit the characters and their time period. There are a lot of Easter Eggs in this image. Things that relate to old stories and characters. A very fun piece to do! It’s so close to Christmas I thought I would share a couple of holiday themed images. This one was done for a wallpaper reward for my patrons on Patreon a couple of years ago. All digital. I don’t get asked to draw The Thing as a commission very often. As a matter of fact, I think only three times so far. But I always enjoy it! This commission was done in ink on bristol board. A watercolor sketch I did based on a digital color sketch I did. Since the introduction of the iPad Pro and the Apple Pencil, so much of my work starts out digital even if the final art will be in a traditional medium. That device has been a real game changer for me. This is a watercolor commission of the Legionnaire, Tellus. I have been a fan of the Legion of Super-Heroes since I first discovered them in a back up story in a Superboy comic in the early 1970s. There are a lot of us Legion fans out there and I am lucky to have so many of them ask me to draw their favorites. This was an inked commission I did some time back that I added some digital color too. The commission request was for a Scottish girl and a couple of Scottish Terriers. This is where I went with it. And it went over well. Ink on bristol board with digital colors in Photoshop. I have left this blog dormant for too long and will change that now. Almost all of my content is created on my Patreon page, with some of it shared from time to time on my Instagram. But I thought I really should make an effort here. So I will be adding updating this blog twice a week. I will try to make it Tuesdays and Thursdays but there might be a little hiccup now and then. If you want to see more up to date images and process posts, those will continue to be on my Patreon page at patreon.com/genegonzales. Above is an commission piece I did for someone at HeroesCon early this last summer. I am not very familiar with the Masters of the Universe characters. I have seen most of them but I don’t think I was ever asked to draw any before this. I’m very happy with how the piece turned out. I might add some digital color to it at some point. The original was done in ink on 11” x 17” bristol board. This started out as a rough for a commission I would finish in watercolor and ink. But I just kept doodling until I had a finished piece, more or less. It was a fun process that was recorded using the recording feature in the Procreate app. This was shared with my patrons on my Patreon page a few months ago. You can watch the Reverse Flash process video on my YouTube channel. SPACE JUNGLE GIRL launches today! Thanks to the support of my patrons over on my Patreon page I have launched my creator owned comic SPACE JUNGLE GIRL! If you have followed my blog you have seen SJG pop up from time to time. Her looks may have changed over time but her core story hasn't and now I have a chance to solidify both and share her story. I'm quite excited about it. If you are interested in following the story and seeing my newest work head over to my Patreon page and join us. Most of my recent artwork is posted on my Patreon page but I am going to start posting that artwork here as well, just a bit later. Over on my Patreon page with the most recent work there are also process videos. These videos are of both traditional and digital mediums. And very soon I will be posting my newest comic book creation, SPACE JUNGLE GIRL. Come join the fun! In the meantime, here is a classic Aquaman! Ink on 11" x 17" Strathmore bristol board, digital color. 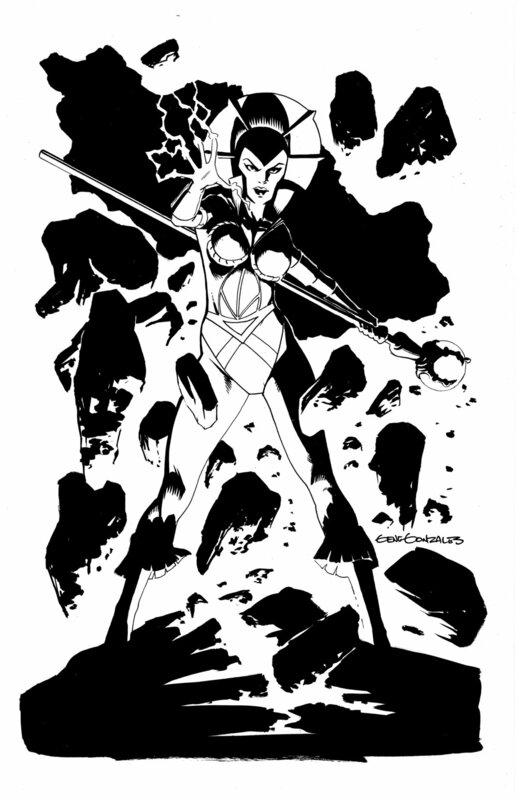 HeroesCon Sketch List and Conventionless Convention Commission List is Open! It is almost time for my favorite convention!!! I am really looking forward to the show and seeing everyone again! And it's time to open up the advance commission list. I will actually work on this list leading up to the convention. Especially the more complicated pieces. At the same time I will be taking on a number of Conventionless Convention Commissions (CCC) for those that can not attend HeroesCon. PERILS ON PLANET X for sale at IndyPlanet! All three issues of PERILS ON PLANET X by Yours Truly and Gene Gonzales, with colors by Ian Sokoliwski, are available to purchase NOW! Sales of these issues will help Gene and I determine whether there's enough demand for Volume 2: "Agent of Empyr," so if you'd like to see further PERILS ON PLANET X adventures, be sure to order your copies soon. You can order either print or digital downloads. Or both if you so desire. I hope you will join us on Planet X! There are more details on that page as well as the download. I hope you enjoy the wallpaper and I hope you will give our series a shot. Another batch of Legion commissions featuring the Legionnaires in costumes from different time periods. I hope you enjoy them. Ink and watercolor on 11" x 17" watercolor paper.